Shrimp bisque. Sounds good, yes? Canning it seems almost impossible because, apparently, botulism spores can hide in dairy fats and not be destroyed in the pressure canner. I did find suggestions about how to can clam chowder - basically you make the whole recipe without the dairy and just remember to add the dairy when you heat it up. So I thought maybe I could modify the recipe for the shrimp bisque the same way. Fry the onions in the oil, add the shrimp and tilapia and cook until heated. Sprinkle with the flour and cook for a minute. Add the stock, tomato paste, and spices and boil for 1-2 minutes. Using a hand blender, puree. It doesn't have to be completely smooth. Add the tomatoes and salt (to taste), cook a few minutes. At this point, I put up 4 pints and processed for 100 minutes at 10 lbs. of pressure. To each pint, when opened, one would need to add 2-3 tablespoons of half and half and some cayenne pepper. I added 1/2 c. of half and half and about 1/8 tsp. of cayenne pepper to what was left in the pot, and that was dinner tonight. *When it came time to add the curry powder, I couldn't find any. Kinda freaked out, actually. I ended up making my own by mixing 2 T. cardi, 1 T. turmeric, and 3/4 t. ginger. It wasn't until after I mixed all this up that I found my curry powder, right where it was supposed to be. Go figure. 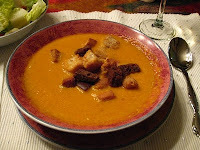 Sounds (and looks) delicious - a perfect dinner for a cold winter night.